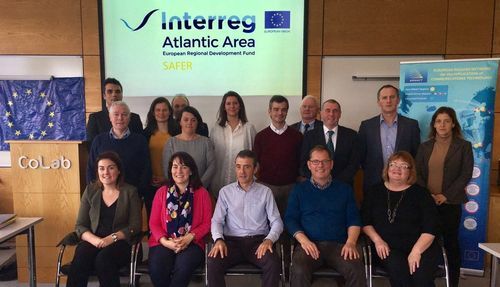 The CPMR and its Atlantic Arc Commission took part in the kick off meeting for the ‘SAFER – Smart Atlantic Seafood Clusters’ project on 15 November, in Letterkenny, Donegal. The SAFER project aims to improve the innovation performance of the seafood industry by increasing technology adoption and transnational cooperation to give response to the challenges faced by a sector identified as key for the smart growth of the participating Regions. SAFER will drive innovation with a clear ambition of expanding the results into other Atlantic Area Regions, including Atlantic Canada, where this sector is considered as high-importance. The project will serve as a “capacity building” network to prepare the partnership to set up. Co-funded by the European Union through the Atlantic Area Programme, SAFER is a three-year project led by ERNACT, and running from October 2017 to September 2020. It brings together partners from Bretagne (France), Border, Midlands and Western Regional Assembly (Ireland), Northern Ireland (UK), Norte (Portugal) and Cantabria (Spain). This project is related to the Atlantic Arc Commission and CPMR’s work on fisheries and innovation. The CPMR is engaged in the project, in particular in leading a work package on capitalization and hosting the closing conference in 2020.